Full weightbearing as tolerated with hinged brace locked in full extension for 4 weeks. Patient will be instructed to come out of the brace twice a day for gentle, passive stretching into flexion. Avoid active knee flexion for 4 weeks. Regular assessment of gait to watch for compensatory patterns. Watch especially to avoid posterior-lateral knee thrust in stance phase of gait. Regular manual treatment to soft tissue and incisions to decrease the incidence of fibrosis. Avoid direct palpation to surgical portals x4 weeks, “no touch zone” 2 inches from portals. Refer to wound care protocol for full details. No high impact or cutting/twisting activities for at least 3 - 4 months post-op. MD/nurse follow-up visits at Day 2, Day 14, 1 month, 4 months, 6 months, and 1 year post-op. Nurse visit Day 2 to change dressing and review home program. Icing and elevation regularly. Soft tissue mobilization to quadriceps, posterior musculature, suprapatellar pouch, popliteal fossa, iliotibial band, Hoffa’s fat pads. Straight leg raise exercises (lying, seated, and standing), quadriceps/adduction/gluteal sets/abduction exercises. Hip and foot/ankle exercises, well-leg stationary cycling, upper body conditioning. Manual resisted (i.e. PNF patterns) of the foot, ankle, and hip. Continue with pain control, range of motion, soft tissue treatments, and proprioception exercises. Non-weightbearing aerobic exercises (i.e. unilateral cycling, upper body ergometer, Schwinn Air-Dyne non-involved limb and arms only). Trunk and gluteal stabilization program. MD visit at 4 weeks post-op; will wean off use of rehab brace. Brace range of motion can be set at open during wean off process. Manual treatments to work on full range of motion flexion and extension, initiate scar mobilization once portals completely closed. Stretches for full range of motion. Incorporate functional exercises (i.e. knee bends/squats, calf raises, step-ups, proprioception). Stationary bike and progressing to road cycling as tolerated. Slow walking on treadmill for gait (preferably a low-impact treadmill). Pool/deep water workouts (once incisions are healed). Initiate active range of motion knee flexion. Unlock brace, slow transition to wean off brace. Increase the intensity of functional exercises (i.e. cautiously increase depth of closed-chain exercises, Shuttle/leg press). Do not overload closed- or open-chain exercises. Add lateral training exercises (i.e. 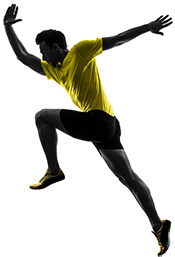 side-step-ups, lateral stepping) once adequate mechanics are achieved. Patients should be progressing to walking without a limp. Introduce more progressive single-leg exercise (i.e.Theraband leg press, single-leg calf raises). Careful analysis of gait and mechanics with corrective treatment (i.e. orthotics, gluteal strengthening). Low-impact activities until able to demonstrate adequate completion of a functional/sport test. Increasing intensity of strength, power, and functional training for gradual return to activities.